Green revolution has entered shop management also. The wisdom is in taking it a step forward and introducing it to store management. Reduced energy costs, improved productivity and reduced health impacts of building operations, growing evidence of increased sales from day lighting, averaging 4-5%, marketing benefits & corporate social responsibility exemplified in green buildings. This list is indicative of what green retail stores and retail-center developers should consider when weighing the costs and benefits of greening their operations. “Certain consumer surveys in developing countries show that the consumers are perturbed by issues like Global warming and would not be averse to paying a little extra for sustainable products and practices. Greening of supply chains and using energy efficient design strategies could help, infact, cut down costs. A green retail image could thereby attract more consumers” says Mr. Sanjay Agarwal, Managing Director, Future Research Design Company. Speaking on behalf of Woodland India, Mr. Harkirat Singh, and Managing Director said, “We have incorporated the Pro Planet initiative which has reduced our operation costs to a marginal level as well as attaining 25-30% increase in sales returns, which is a complete win-win situation for us” “At The Body Shop we are passionately committed to minimising the impact of our business on the environment, and proud to take this all the way from our sourcing, supply chain, store fascia’s, visual merchandising and of course finished products”. The first and foremost challenge to greening the retail sector is cost. Other challenges include the capabilities of the design and construction teams to provide green features on conventional budgets. Getting a LEED certification for a green retail development is initially going to cost more, and it’s not clear that a developer can recoup these extra costs in higher rents or faster lease-up, at least not right now. It is possible that the developer may realise some marketing and public relations benefits, but that is also speculation at this point. “The retailers are worried about their ROIs and the developers are apprehensive about rising costs on one hand, and the vendors’ suppliers on the other hand who need to be kept abreast of global environmental norms being expected in materials and processes”, Mr. Agarwal added. 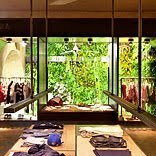 Sustainable store design needs to be given the same priority that products and ‘bag for life’ have been given; communicating this priority is something that needs to come from the highest level and must be implemented throughout the business. According to many Indian manufacturers, products from recycled materials are of “low standards”. India needs a body like “Green guard” to certify a product as being environmental. But to be fair, there are other manufacturers who would like to know how to make their products more eco friendly but do not know where to go. The government should step in and make its presence felt in the environmental awakening spreading across the globe. It should subsidise the prices of all things environmental.